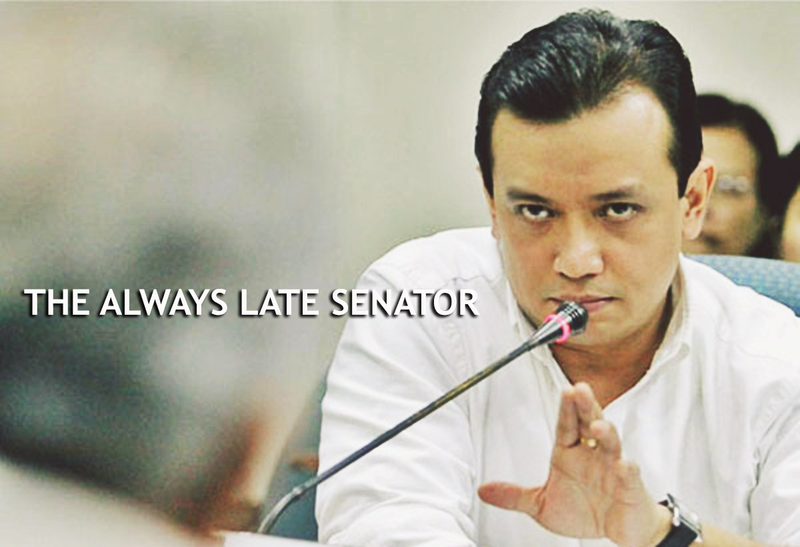 According to Senate's Journal Service, Senator Antonio Trillanes IV registered the most number of late arrival from from July 2016 to May 2017. Out of the 89 regular session days from July 25, 2016 to May 31, 2017, Trillanes was only present on 72 sessions. Trillanes has spent 16 days abroad. Majority Leader Vicente Sotto III and Senator Panfilo Lacson recorded not only a perfect attendance, but were also punctual in all of the 89 session days. Senators Risa Hontiveros and Gringo Honasan both came in second, as they were only late for one session day, but were present in all. Senator Miguel Zubiri also completed 89 session days, but was late 19 times. Senators Francis “Chiz” Escudero and Richard Gordon attended 86 session days, while Senators Nancy Binay, Sherwin Gatchalian and Joel Villanueva each attended 85. Senator Manny Pacquiao, who was an absentee congressman in the House of Representatives, showed up 84 times and was absent only twice. He was on official mission for three days. Those who also showed in 84 out of 89 session days were Minority Leader Franklin Drilon, and Senators Francis “Kiko” Pangilinan and Bam Aquino. Senate President Pro Tempore Ralph Recto was present for 83 days, while Senate President Aquilino “Koko” Pimentel III, Sonny Angara, and Loren Legarda were present in 82 plenary sessions. Senator Cynthia Villar was present for 80 session days, while Senator Grace Poe attended 79. Senator JV Ejercito meanwhile missed 12 session days when he served his preventive suspension over the alleged anomalous firearms deal. Senator Leila de Lima meanwhile was recorded absent for 23 days. De Lima, presently detained at the PNP Custodial Center in Camp Crame, was arrested and has been detained since February 24.